Researchers at Cornell University have found a novel technique for powering simple robots with an innovative substance that, upon being heated, has the ability to expand in size by over 10 times, vary its viscosity by a factor of 10, and transition from regular to highly irregular granules with astonishing force. It can also be eaten with a little butter and salt! “Popcorn-Driven Robotic Actuators,” a recent paper co-authored by doctoral student Steven Ceron, mechanical engineering, and Kirstin H. Petersen, assistant professor of electrical and computer engineering, investigates how the distinctive qualities of popcorn can power low-cost robotic devices that expand, grip, or change rigidity. The research is the first to consider using popcorn - which is cheap, biodegradable, readily available, and of course, edible - to power robots. As corn kernels have the ability to expand quickly, exerting force and motion upon being heated, they could prospectively power miniature jumping robots. Edible devices could be ingested for medical procedures. The blend of unpopped, hard granules and lighter, popped corn could replace fluids in soft robots, eliminating the need for compressors or air pumps. Pumps and compressors tend to be more expensive, and they add a lot of weight and expense to your robot. With popcorn, in some of the demonstrations that we showed, you just need to apply voltage to get the kernels to pop, so it would take all the bulky and expensive parts out of the robots. As kernels do not shrink once they are popped, a popcorn-powered mechanism can, in general, be used only once, but multiple uses are conceivable since popped kernels can dissolve in water, stated Ceron. The scientists performed the experiments using Amish Country Extra Small popcorn, chosen since the brand does not use additives. The extra-small type had the highest expansion ratio among those tested by them. Once they analyzed the properties of popcorn using various types of heating, the scientists built three simple robotic actuators - devices used to execute a function. 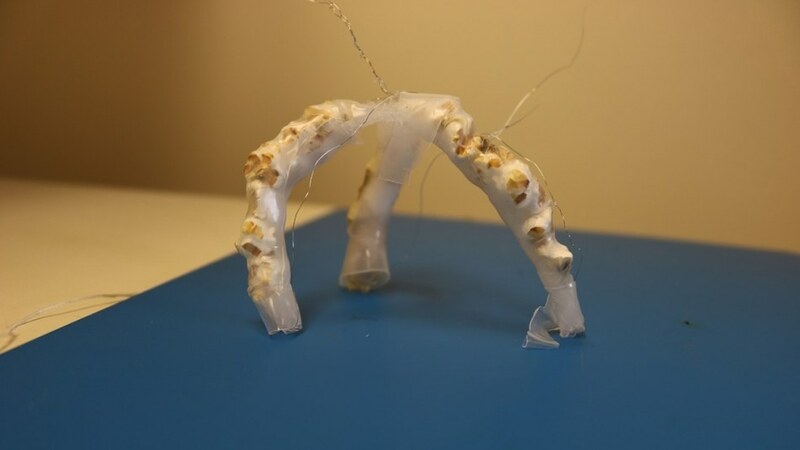 To develop a jamming actuator, a flexible silicone beam was stiffened using 36 kernels of popcorn heated with nichrome wire. To construct an elastomer actuator, they built a three-fingered soft gripper, with silicone fingers that were stuffed using popcorn heated by nichrome wire. Once the kernels popped, pressure was exerted by the expansion against the outer walls of the fingers, making them curl. To develop an origami actuator, recycled Newman’s Own organic popcorn bags were folded into origami bellows folds, filled with kernels, and microwaved. The expansion of the kernels was sufficiently strong to support the weight of a nine-pound kettlebell. The paper has been presented at the IEEE International Conference on Robotics and Automation in May and co-authored with Aleena Kurumunda ’19, Eashan Garg ’20, Mira Kim ’20, and Tosin Yeku ’20. Petersen said she believes it would inspire scientists to explore the possibilities of other nontraditional materials. The Cornell Engineering Learning Initiative, the Cornell Electrical and Computer Engineering Early Career Award, and the Cornell Sloan Fellowship supported the study.